Photographed by Helynn Ospina for Lonny. It's one thing to buy and decorate an entire house. But to purchase a brand new space and complete a full home reno? That's a serious creative undertaking. Jill Slattery, the chief content officer of Livingly Media, took on the challenge when she purchased an unfinished property for her family of four. "We absolutely loved our neighborhood, but we were living on the main busy street," says Slattery. "We eventually wanted to move to a quieter block at some point, but we weren’t actively looking for our next home. Then one afternoon, we went out for a family walk and we came across a new home that had just started construction." "The location was perfect — it was in the same neighborhood, but was on a quiet street, and it was even closer to the local school and to the downtown area," Slattery explains. "The builder had been planning to put the home on the market after it was finished, but we made a preemptive offer and it was accepted!" 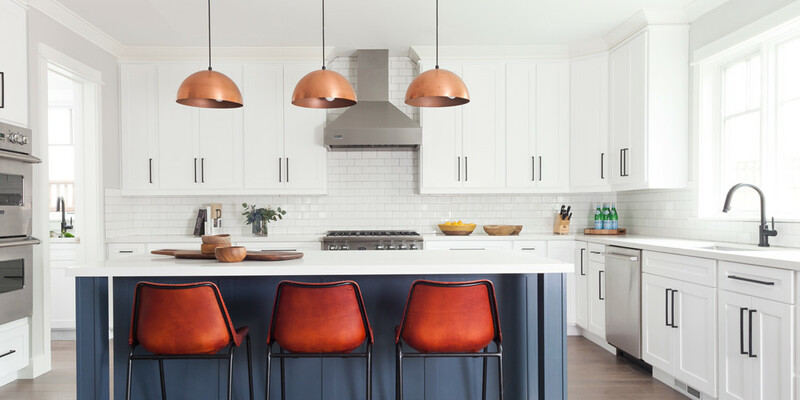 While finding the perfect location was a total win, now the couple had to balance full-time careers and raising two young boys with an entire home renovation. "It was really exciting, but also totally daunting," shares Slattery. "All of a sudden we had a new home, and because we had bought it very early in the construction process, we were able to have input on all of the finishes and fixtures. We thought we could handle choosing everything on our own, but we took one trip to a local tile store with the kids and quickly realized we were in way over our heads." The Slattery family plays around at their dining table. 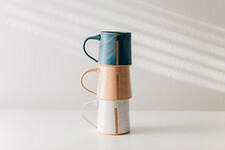 She adds, "We also realized that two busy little boys and tile stores don’t mix — I think we almost broke half the store." The solution to curating the perfect home? Hiring expert interior designer Hannah Collins to get the job done. "Jill was recommended to us by Angela Tafoya (aka Lonny's editorial director!) and we instantly connected over her great style and excitement about their new home," shares Collins. "We love helping clients execute such a large vision as a ground up build so the project was extremely interesting to us!" Slattery agrees that the team was a perfect fit. "They took my all-over-the-place Pinterest mood board — which was basically filled with every single Lonny room I had ever loved — and somehow distilled all the disparate styles into a home that feels warm yet elevated, cool yet comfortable, and completely us," she says. "And they managed to do all of that while sticking to our builder’s schedule." When taking on a large project where each step is a major commitment, Collins makes sure that she is always on the same page as her clients. "We start with really trying to identify what types elements will make the client feel at home and what home means to them," she explains. "Our total approach is always extremely collaborative and at the end of the day we want to create a space that truly exemplifies who the client is and how they live." A custom-tiled fireplace is a great spot for the family to gather. The space also features a standout art piece by woodworker Alexsandra Zee. The first step was pinning down the vibe that the couple wanted to curate in their new home. "We wanted our house to feel cool, yet comfortable," shares Slattery. 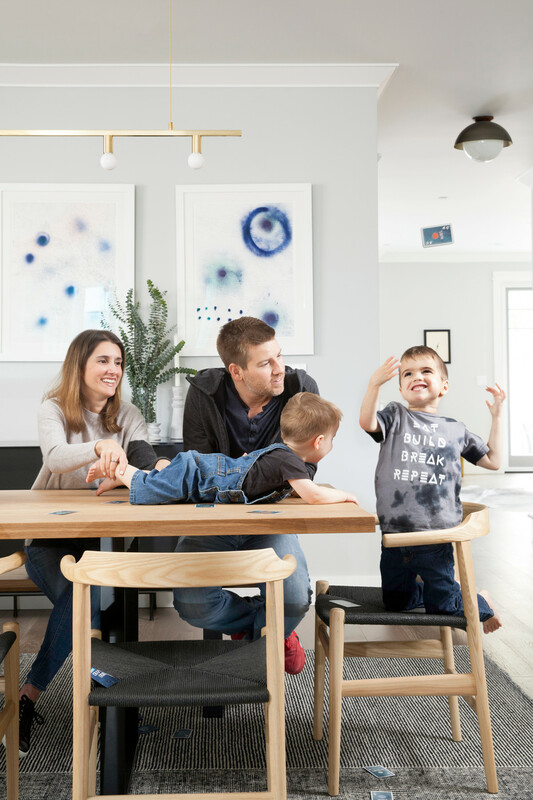 "My husband and I both love homes with high style and really impactful design choices, but we also have two young boys, so we didn’t want the house to feel like it was so precious that our kids couldn’t be kids. Hannah and her team really worked with us a lot on achieving that balance of finding pieces that looked amazing but could handle little feet climbing all over them." 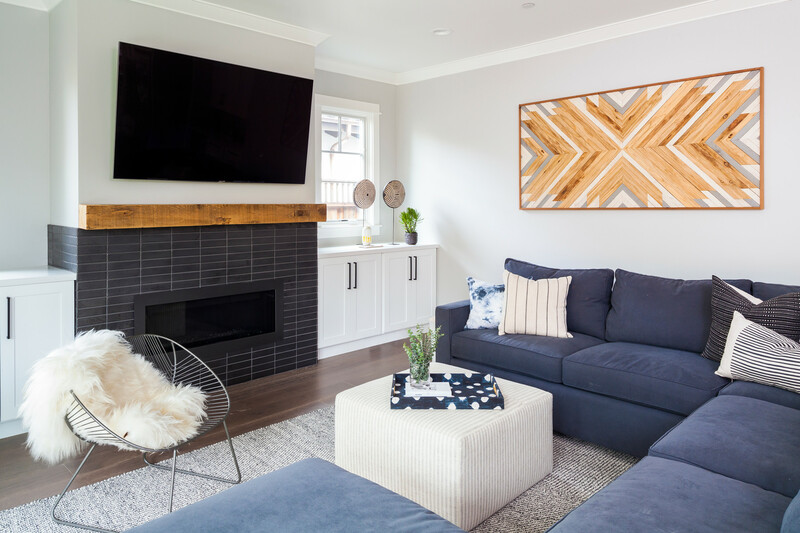 Choosing pieces for main family areas like a custom-made ottoman with soft edges and sprucing up a sectional with printed pillows helped make the space cozy and design-forward. "Jill and her husband Chris have a very fun style," adds Collins. 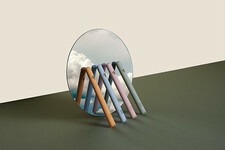 "It's a mix of balanced, textural neutrality, with pops of interesting colors and art. They have a really young, fun sensibility in some of the art they already owned so we started there with a lot of the design direction and let things grow with that inspiration in mind. There is also something really uncomplicated and fresh about their style which I think lends itself to family friendly!" A gorgeous Lambert & Fils light fixture lights up the custom dining room table. While Collins added many incredible fixtures and bold modern accents, a lot of items the couple curated over the years worked as centerpieces throughout the home. "I love the way that our art collection was incorporated into the design work," says Slattery. "We had some existing pieces that were really special to us, so I wanted to make sure that they would work with all of the new elements that were being added. 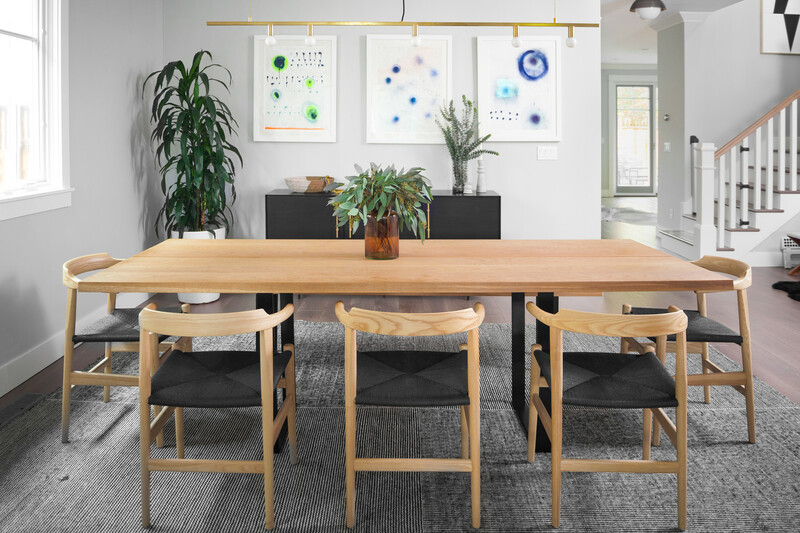 I particularly love the way the three Jennifer Shepard pieces in the dining room provide a bold pop of color above the striking black credenza." "We always try to push clients comfort level to making some fun out of the box decisions," notes Collins. "Not all clients go for it but Chris and Jill were willing to give it a shot and I think, they would agree the results are extremely beneficial to the feeling of the home as a whole." Phillip Jeffries wallpaper gives a floral pop to the powder room while two cool Cedar & Moss sconces add a modern edge. A stool from AllModern provides a glam finish. One of the clear standouts in the home? 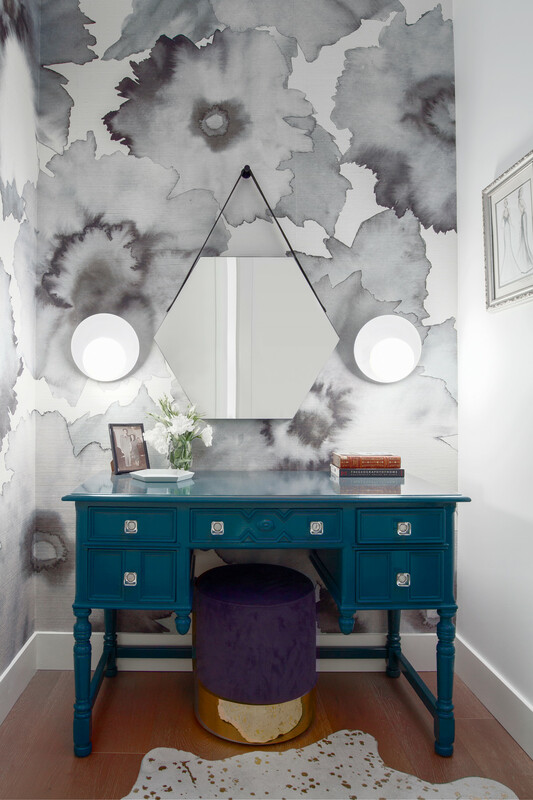 A powder room with a bold wallpaper design by Phillip Jeffries and a mix of modern and vintage pieces. "I love that so much style is packed into such a tiny space," shares Slattery. Not only does the space feel like a burst of creative design, but it also has history to it. "My old antique desk from childhood was transformed into this vibrant, modern piece for the vanity," explains Slattery. "It had been a gift from my grandparents when I was 10, and I had carted it around from apartment to condo to house for years. It was dark and had a distinctly antique vibe." When there was nowhere to place the sentimental piece, Collins came up with an idea to make it brand new. "I brought it up to Hannah, and she came up with this incredible idea to paint it a rich, glossy dark blue and change out the drawer pulls," she says. "I love that the same desk I used to do math homework on has now found this ultra-chic second life." These intimate details along with curated tile, fixtures, and paint throughout the space really helped transform a construction site into the perfect family home. "It has been such a fun project to see come to life," shares Collins. "We love designing homes that tell a story about people and how they live and I think that is exactly what this project ended up being."